Euro moments 1975: Vote yes Jump to media player Foreign Secretary James Callaghan makes the government's case for a "Yes" vote ahead of the European Economic Community referendum in 1975. Euro Moments: Thatcher predicts EU 'nightmare' Jump to media player British Prime Minister Margaret Thatcher rejects the idea of a United States of Europe, during a visit to Luxembourg. 'I've worked for this for 25 years' Jump to media player Campaigners for a "Yes" vote celebrate their success in Britain's 1975 referendum on membership of the European Economic Community. 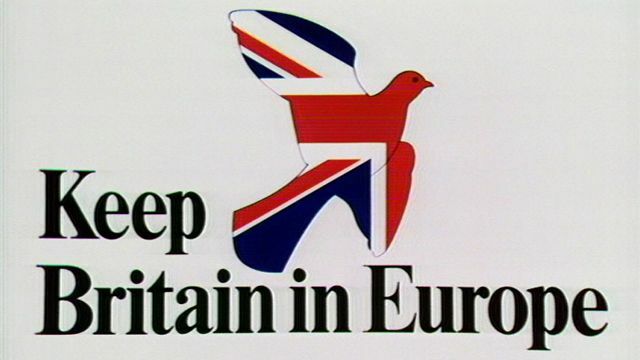 Euro Moments: Party policies on Europe in 1983 Jump to media player The policies of the Conservative, Labour and SDP Liberal Alliance parties toward Europe are examined as the 1983 general election looms. Euro moments 1975: Vote no Jump to media player Patrick Cosgrave, Sally Vincent and Paul Johnson present the case for the 'No' campaign ahead of the EEC referendum in 1975. 'Thank God for Englishmen!' Jump to media player That Was The Week That Was satirises the English reaction to Charles de Gaulle's veto over British entry to the European Economic Community. "This issue has hung around for far too long," says Foreign Secretary James Callaghan as he urges fellow Britons to go out and vote. He said Britain's prosperity - as well as peace and security - would be protected in the common market, making the government's case for a "Yes" vote ahead of the referendum on the UK's membership of the European Economic Community in 1975. Just over 67% of voters heeded their message and backed the campaign to stay in the EEC, or Common Market, despite several ministers in the Labour government having come out in favour of British withdrawal. The result was later hailed by Prime Minister Harold Wilson as a "historic decision". The Conservative leadership also wanted a "Yes" vote. Margaret Thatcher, elected Tory leader earlier that year, said the "Yes" vote would not have happened without the opposition's support.